About us - Fundacja "Nasz Wybór"
The “Our Choice” Foundation was founded in 2009 by Ukrainians and their Polish friends to work for Ukrainian migrants in Poland, help them to integrate with Polish society and Polish culture, and to familiarize Poles with Ukrainian culture. With time, the Foundation has expanded the group of recipients of its activities to citizens of other countries. In 2004, a group of friends – Ukrainians and Poles – organized in Warsaw to support the “Orange Revolution”. At that time, not only in Ukraine, but also around the world, Ukrainians began to unite and act to create an open civil society. The active Ukrainians from Warsaw supported by Poles also undertook similar activities. For five years, the Citizens’ Initiative “Our Choice – Ukraine” participated in various projects, including co-founder of the Welcome Center in Warsaw, which supported migrants from various ethnic groups, both sexes and ages, providing them with legal assistance or organizing cultural and educational events. The “Nasz Choice” Foundation was officially registered in 2009. The main goal of the “Our Choice” Foundation is to help integrate Ukrainian migrants with Polish society, to support the development of cultural, educational, economic and political contacts between Poland and Ukraine, and to promote democratic values and civil society. Most of the activities are addressed to migrants from Ukraine in Poland, but the Foundation regularly joins initiatives and projects concerning other groups of foreigners staying in Poland. 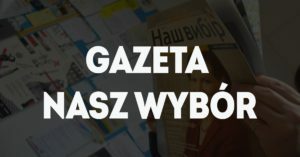 The Foundation conducts an active information activity by publishing the newspaper “Our Choice” for Ukrainians staying in Poland and running the portal www.naszwybir.pl. It also organizes regular meetings with readers on which topics relevant to Ukrainians in Poland are discussed or interesting people appear, e.g. famous Ukrainian writers. The Foundation very often takes part in various cultural events, such as the Independence Day of Ukraine in Warsaw, and initiates expert meetings aimed at increasing the effectiveness of activities for the benefit of Ukrainian migrants in Poland. It is worth emphasizing that all the activities of the “Our Choice” Foundation focus on helping foreigners in Poland in everyday life and reaching them with the necessary information and support. The Foundation also conducts sociological research. In cooperation with the Foundation of Socio-Economic Expertise Institute, we implemented the project “Immigrants with high qualifications on the Polish labor market. Social research”. The main objectives were to provide knowledge about the labor market situation of immigrants with higher education diploma, study the practical operation of legal regulations aimed at providing real migrants-graduates of Polish universities with opportunities to access the Polish labor market, and reveal obstacles in the integration of immigrants on the labor market, especially those related to the social image of immigrants as employees and employers. Since May 2014, the ” Our Choice” Foundation has been implementing a very interesting and very successful project: the Ukrainian Women’s Club. Its objective is to help Ukrainian middle-aged women who come to work in Poland, to integrate in a new country and find their place in the Polish reality. The club meets regularly every Sunday, each meeting is devoted to a different topic or problem. Sometimes they are handicrafts or culinary workshops, sometimes – meetings with experts from various fields, thanks to them the members (more and more often also young Ukrainians) gain useful knowledge. Recently, the Academy of Managers has also started its activities: members conduct workshops for other women. The ” Our Choice” Foundation has been devoting a lot of attention to the youngest migrants since the beginning of its activity, conducting art workshops and publishing books. Another initiative of the foundation is a weekend club for children “Glove”, providing the integration of children and parents and familiarizing them with Ukrainian culture and language as part of interesting and creative activities. The “Our Choice” Foundation also conducts charitable activities, acting as the initiator or co-organizer of numerous collections for the needs of the Ukrainian army or refugees from Ukraine. For example, the campaign “Dressing for the bag”, under which the organizers sell organic handbags with Ukrainian embroidery, and obtained funds are used for medicines for Ukrainian soldiers. The “Our Choice” Foundation also co-organizes the “Help Ukraine” project. From the beginning, the foundation has been involved in activities to support Ukraine, especially in its efforts to integrate with the European Union. The “Nasz Wybór” Foundation has created the Ukrainian House – a place where many activities and meetings can be conducted. The Foundation intends to invest in its development to make it the heart of the Ukrainian community in Warsaw. We want to continue current projects and expand our information activities. Obviously, our priority is to help those who need it.